WhatsApp update introduces New Status Feature Like Snapchat : Whatsapp has re-designed the status tool – which until now has only offered the option to put a piece of text next to your name, like “at the gym” – so now WhatsApp status same as Instagram stories and Snapchat. And it is just the latest Facebook company to do so – Facebook’s own app taking its competitors innovations. Now Folks will able to post pictures similar way to how stories work on Snapchat and now Instagram. They will be able to add pictures with Friends – until they are automatically deleted. 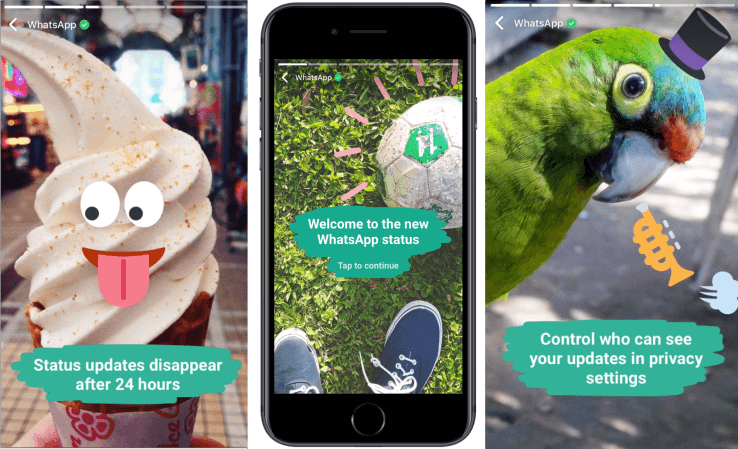 WhatsApp could brakes on Snapchat’s international growth with today’s launch of WhatsApp Status New Feature, a new tab for sharing decorated photos, videos and GIFs that disappear after 24 hours. It’s another Facebook-owned Snapchat Stories copycat. Whatsapp Tested this Feature for Beta Users in November and From today WhatsApp Status Feature Rolling Worldwide on iOS, Android and Window Phone Users. In New Status Feature Users can Watch Updates from Friends and Reply In Private Message Like Instagram Stories, adorn their imagery with drawings and captions and send their creations to all their contacts they’ve chosen with a persistent privacy setting. Even after we added messaging in the summer of 2009, we kept the basic “text only” status functionality in WhatsApp. Every year, when Brian and I would plan projects to work on, we always talked about improving and evolving this original “text only” status feature.